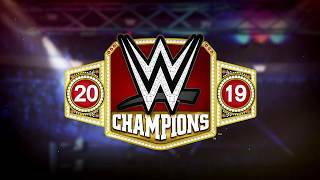 The WWE 2K19 Downloadable Content offerings include playable WWE, NXT and 205 Live Superstars, a large variety of new in-game moves, and access to both unlockable content and player progression features. The individual content packages will begin releasing in late 2018, with some packages releasing in early 2019, for PlayStation 4, Xbox One and Windows PC. Let's take an in-depth look at the content that these DLC Packs include, giving you all the information you need to know! 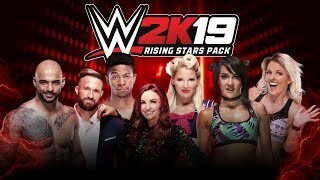 The WWE 2K19 "Rising Stars" Pack features WWE, NXT and 205 Live Superstars: Candice LeRae, Dakota Kai, Lacey Evans, Lio Rush, Maria Kanellis, Mike Kanellis and Ricochet. The WWE 2K19 "Titans" Pack features WWE and NXT Superstars: Bobby Lashley, EC3 and War Raiders (Rowe and Hanson). Special characters for Dusty Rhodes, Macho Man Randy Savage, Ric Flair, Ricky Steamboat, Roddy Piper and Undertaker (2002) are included in the WWE 2K19 Deluxe Edition and Wooooo! Edition on launch day. Otherwise, if you have the standard edition of the game, this DLC Pack will be available to buy separately at a later date. Players who Pre-Order WWE 2K19 at any participating retailer will receive playable characters Rey Mysterio & Ronda Rousey, at no extra cost on launch day. NOTE #1: If you are pre-ordering the WWE 2K19 Deluxe Edition or the WWE 2K19 Wooooo! Edition, the full Season Pass is already included in those versions. NOTE #2: The Pre Order Pack and the Wooooo Edition Pack are NOT included in the Season Pass. For more info on WWE 2K19 check out the News Section, and as always, for the full updated list of confirmed characters and their respective profiles, you can visit the full WWE 2K19 Roster Page, featuring all the Superstars, Women and Legends from WWE and NXT included in the game. What do you think of the WWE 2K19 DLC? Leave a comment with your thoughts down below!